Adapting the patented Kinergy Drive System to Vibrating Conveyors innately brings many benefits that were not previously available. This includes “Energy Efficiency” and added operating versatility. The Vibratory Drive. The electrically adjustable conveying speed is beneficial for picking, inspecting, cleaning, or similar purposes while being conveyed. So is the automatic, repetitive “pulsing” to a more vigorous vibratory action when sticky (adhesive) bulk solids are being transported. Others include repeated starts with full loads being tolerated. So are other types of abusive loading. Installation under the outlet of a Bin or Silo, or being supplied by loader dumps or other large batch loads such as those from casting cleaners in a Foundry, is permissible. Of course, for these applications the Conveyor’s trough has needed structural integrity. The markedly reduced cost of Dynamic Counterbalancing with its stability when the Conveyor changes from no load to full load easily overcomes the alternative choice of a non-balanced design. The price savings appears to be meager when the increased installation cost and the realistic risk of the transmission of nuisance vibration to the surrounding area are taken into account. Conveyors of long lengths are now practical. Particularly when heavy loads are being carried. The reason is the needed motors are appropriately spread all along the length. The multi-motor combination automatically synchronizes to develop the total amount of power required. This motor distribution also minimizes the dynamic stresses which helps to make very long Vibrating Conveyors possible. Sanitary, food grade, extra heavy duty, low profile, dynamically counterbalanced, and non-balanced design Vibrating Conveyors are available with virtually all types of trough construction. 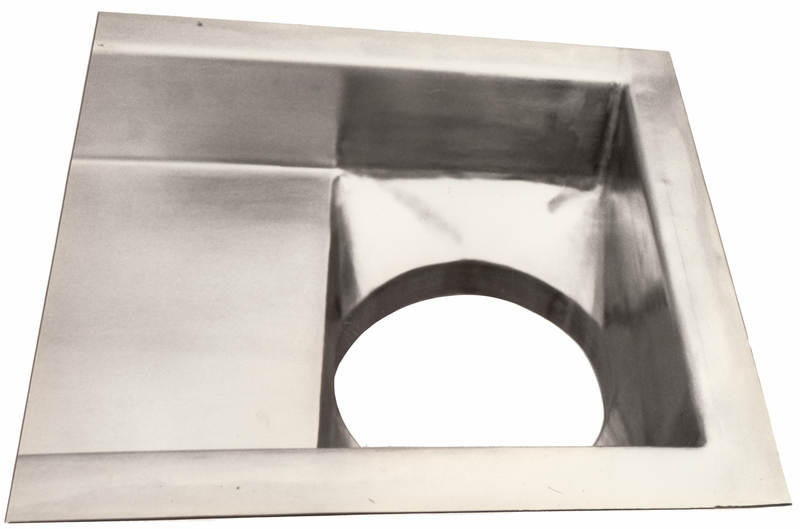 Carbon steel, stainless steel, and fiberglass are just a few of the fabrication materials available. Kinergy can supply any number of finishes, including sanitary polishes that meet FDA standards, as well as various coatings. If mechanical adjustments at “start-up” are needed with any Kinergy Driven Machine, they are easy to do. 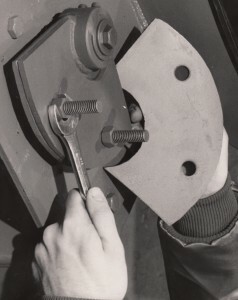 The bolting of “tuning plates” to the frame or adding eccentric weights to the motor are readily accomplished. 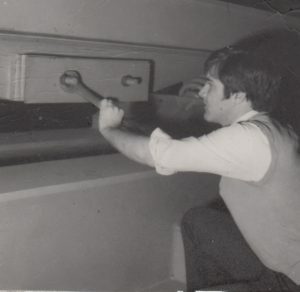 Durability: Kinergy Vibrating Conveyors are built to last with an average of 20 or more years of productive use. Proven Performance: The simple design and highest performance rating make Kinergy the best choice for Vibrating Conveyors. 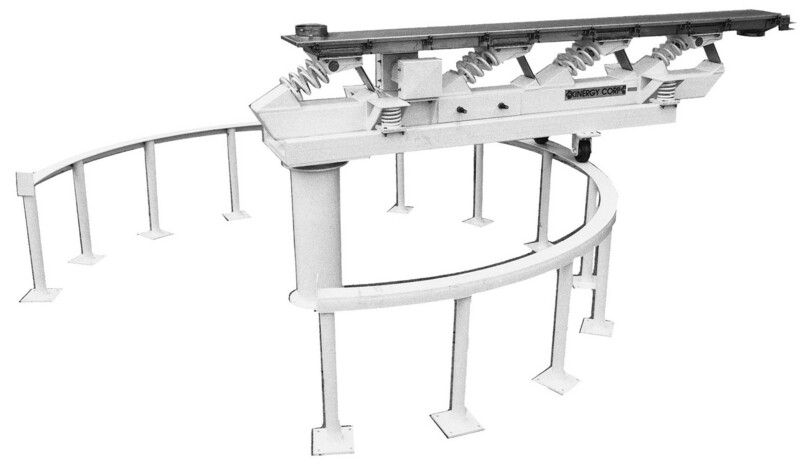 Energy Efficiency: All the Conveyors utilize the Kinergy Drive System, which is the most versatile and energy efficient one available. This drive is a combination of a free force input from an A.C. type electric motor with the output of sub-resonant tuned springs. When the applied load increases, the springs inherently drive harder. It maximizes the use of “Kinergy” which is defined as the kinetic energy developed by a spring’s motion during the drive portion of its cycle. Dust-Tight Construction: Kinergy Vibrating Conveyors can accommodate environmental standards with dust-tight covers that will minimize or avoid dust emissions. Quick opening viewports in the top cover permit observing the conveying. Versatile Applications: Kinergy Vibrating Conveyors are inherently self-cleaning which makes them desirable for sanitary applications or when material contamination is to be minimized or avoided. Sanitary polishes that meet FDA standards are available. 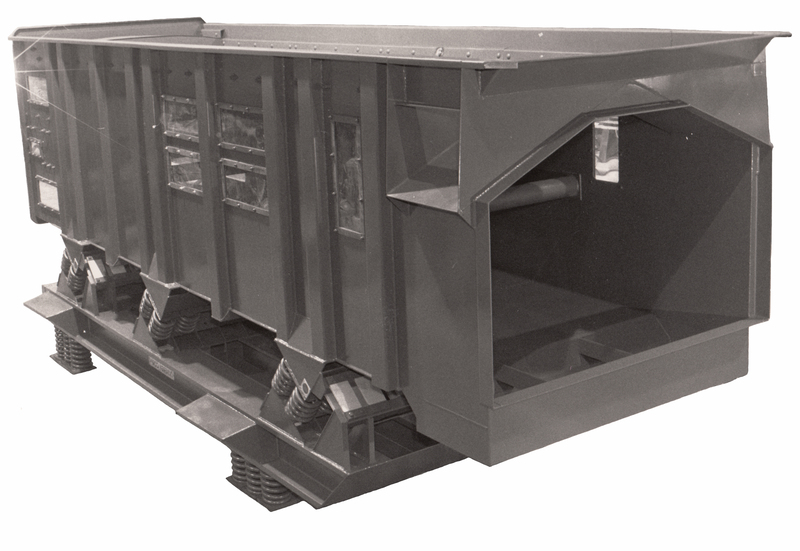 Underside Design: The vibratory drive system is located underneath the conveying trough. This is the usual location for Kinergy Driven Conveyors. Top Drive Design: The vibratory drive system is located above the conveying trough. This arrangement allows the bottom of the conveying trough to be fully accessible for various discharge ports. 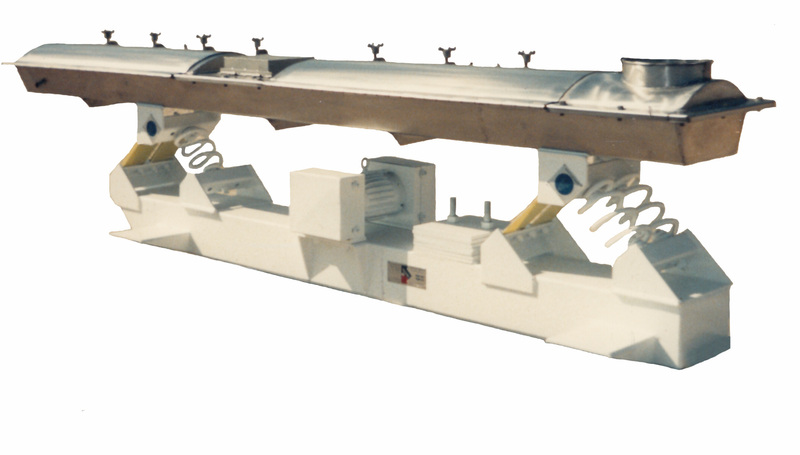 Larger Dimensions: Kinergy Vibrating Conveyors can be manufactured in larger dimensions. Since the Kinergy Drive distributes the input dynamic forces, the diameter or length and width dimensions are not restricted as they would be if they were concentrated at one point. For this reason, Kinergy Driven Vibrating Conveyors are unidirectional and standardized in widths to 18 ft. and lengths and diameters as required. Simple Electrical Control: Our innovative technology improves performance. The operating stroke and frequency on Kinergy Vibrating Conveyors can be automatically and repetitively “pulsed”. Tolerating Headloads: The repeated starts and stops are not detrimental to the Conveyor. 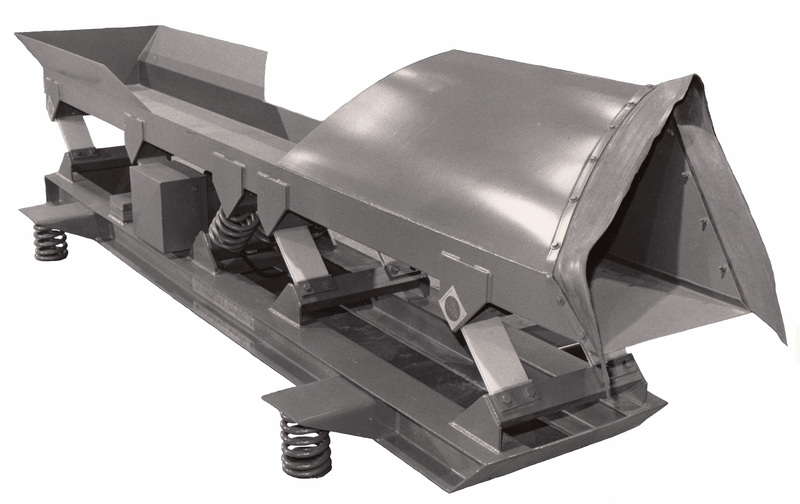 Reduced Sound Levels: Reduced sound levels are another benefit of Kinergy Vibrating Conveyors. Our Conveyors typically operate less than 80 dBA in the loaded condition. 45° Stroke Angle: Instead of being limited to 30°, the better conveying angle of 45° can now be used when it’s wanted. Adjustable Conveying Rate: Inherent with the Kinergy Drive, the full range of adjustment is available. This elevated control is useful for reducing operating noise, heating particles and cooling “unit pieces” such as Foundry castings. Minimal Maintenance: Kinergy’s Vibrating Conveyors only require the “look and listen” principle of maintenance. Just note the stroke and listen for noise. 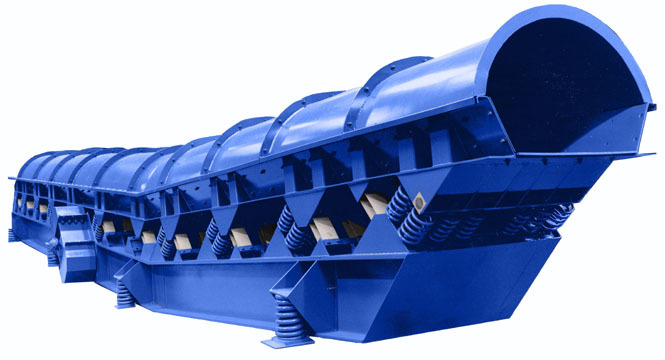 Interchangeable Components: Most of the component parts of the Kinergy Vibrating Conveyor are interchangeable with other Kinergy Driven units even though their functions may differ. These common components extend to Kinergy’s Vibrating Feeders, Screens, Fluid Bed Coolers and Dryers, Spiral Elevators and various types of Foundry units. This reduces the number of spare parts required in inventory. The patented Kinergy Drive System has proven to be the most versatile and energy efficient vibratory drive known when applied to Induced Conveying machines. This makes Kinergy Vibrating Conveyors the optimal choice. 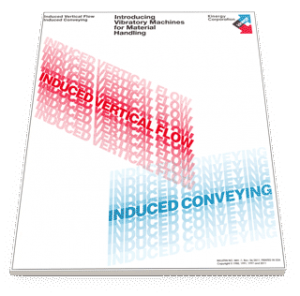 To learn more about these innovative machines, please contact Kinergy at 502.366.5685 or download Kinergy’s descriptive Bulletin KDC-1 entitled “Kinergy Driven Vibrating Conveyors”.